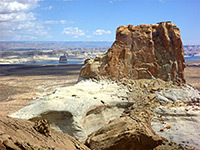 The western shore of Lake Powell is bordered by sandy flats, crossed by highway US 89, but the land rises a little further west by about 600 feet to a broad mesa, spanning the Arizona/Utah stateline. The northeast corner forms a narrow promontory known as Stud Horse Point, approaching to within a few hundred feet of the road, and while there is little of interest on the level ground on top or below the escarpment, the sloping cliffs around the edge of the mesa do harbor some photogenic places, the best being a little ravine which is lined by several dozen large hoodoos, composed of dark brown, partly conglomerate boulders on top of green or red pedestals, made especially scenic by the big drop-off just beyond, with Lake Powell visible in the distance. 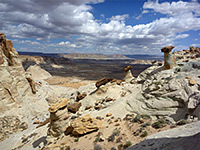 Other places along the mesa edge have lesser eroded features, and much exposed slickrock in a range of muted colors. 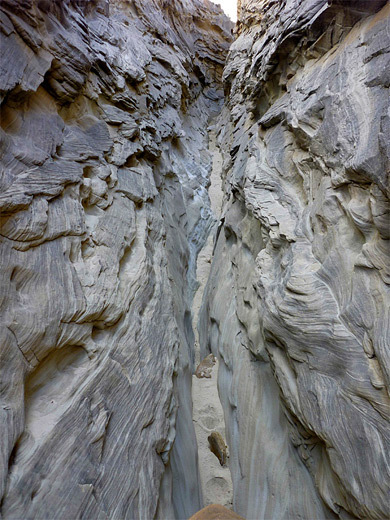 Also worth visiting, at the foot of the cliffs, are a couple of short slot canyons, at the head of an unnamed drainage that joins the lake several miles east, right opposite Lone Rock. 29 views of Stud Horse Point; gallery, slideshow. 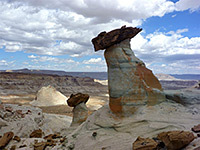 One possible approach to the hoodoos is along a sandy track that leaves US 89 to the west, just north of the side road to Lone Rock Overlook, and ends after 1.3 miles at a corral; the hoodoo ravine is half a mile away, reached after a walk up steeply sloping slickrock. 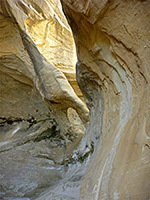 The most used route however leaves the highway 2 miles south of the Lone Rock turning - an old paved road that heads northwest, becomes gravel then bends westwards, the surface now sandy, and leads to the south end of the cliffs, here just a narrow band of exposed sandstone. Non 4WD vehicles should probably park here, beside a graffiti-covered concrete bunker at Bishops Tank, but other, somewhat sandier tracks continue, one bending north along the upper edge of the cliffs and up a hill directly to the brink of the ravine. One such route heads southwest towards the Paria River canyon. From the 2WD parking area, the hoodoos can be reached by walking along the mesa rim, on or beside the 4WD track, but a more interesting approach is lower down, across the slickrock, which becomes wider after about a mile, extending further east and rising to a broad pinnacle. This is directly opposite the little gully containing the hoodoos. This ravine is bordered on the northwest side by vertical cliffs but by more gently sloping ground to the southeast, location of the formations. Lower down the drainage forms a short, steep slot through uniformly light grey sandstone, but the rocks above are more varied in color; the bases of the hoodoos are composed of thin greenish grey or red layers, while the tops are harder yellow or brown caprocks, often made of conglomerate - similar to the nearby Wahweap Hoodoos. A few more pinnacles are found at the very upper end of the ravine, while the cliffs to the north have occasional smaller ones, extending another mile towards the eastern tip of Stud Horse Point. Fractured, multicolored rock layers from the upper section of the cliffs, while lower down the surface is smoother and more homogenous. 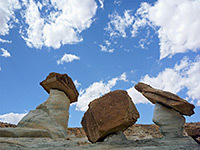 The hoodoos are tall and thick, not slender and graceful like at some similar locations. The ravine is partly in shadow early and late in the day but this is still a good place for sunset photography. An isolated butte rises from the valley floor just north of the hoodoo ravine, and not far beyond are two forks of a minor drainage, both of which form shallow slot canyons; if approaching from the hoodoos, the easiest route is steeply down the east side of the ravine, followed by a 20 minute cross-country walk over the mostly flat land beyond, with just a few sandy dry washes to cross, and the AZ/UT stateline. The southernmost fork of the drainage has the longest enclosed section, never very narrow or deep but framed by some pretty passages through gray/brown rocks with smooth or fractured textures. In places the streamway widens enough for bushes to grow but most sections have only bare rock. The slot starts with a slide down to a chamber and is narrow for 0.3 miles. There are no significant chokestones or pools but a few parts are too tight to walk at floor level. 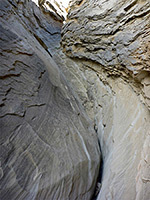 The canyon opens out abruptly at the junction with the shorter north fork, in which the main point of interest is an arch, at the side of a chamber near the upper end of the enclosed section, just below a dryfall.